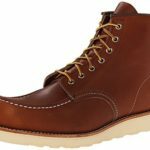 Have you ever found an amazing pair of work boots with terrible insoles? This happens a lot, especially if you have uniquely shaped or difficult feet. Instead of spending hundreds of dollars trying out different work boots, invest in an insole that helps the boot give you the support and comfort you need to get through the work day. We’ve checked the brands, the designs, and the prices of the best insoles to get you a list of all the top contenders. Below, you’ll find reviews for some of the best insoles for work boots. 2.4 Why Do I Need an Insole? Even though this insole is designed with the intention of replacing Timberland insoles as they break down with wear, they are a great companion to any work boots. The insole is split into two separate layers, which increases its ability to provide comfort and support. 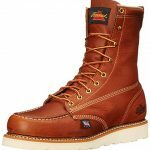 The dual layers makes the name ‘anti-fatigue’ accurate, as your feet will no longer feel worn out at the end of a long day standing, climbing, or walking around in your work boots. 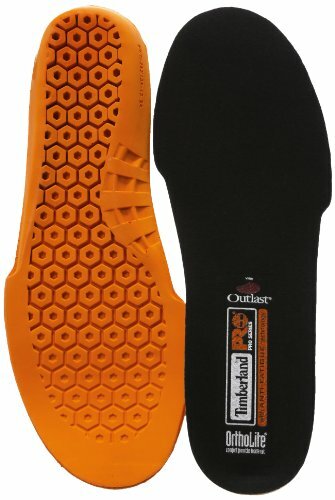 The top layer of the Timberland PRO Men’s Anti-Fatigue Technology Replacement Insole is made of an OrthoLite material. This provides a soft layer of comfort and additional padding. 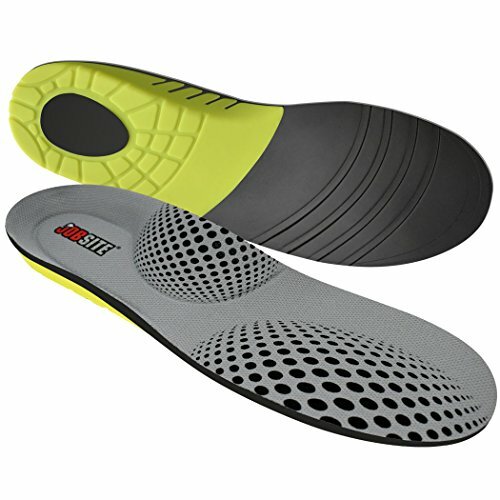 These moderately priced insoles have a full-length geometric cone design that absorbs impact and returns energy. Additionally, there is an Outlast top cover that stretches over this to control odors and bacteria and prolong the life of your insole. It even helps regulate temperature—without making the insole heavy. You can wash these with soap and water if you like. The bottom of the insole is made of a synthetic material with a hexagonal pattern of cones. The pattern lets the insole absorb shock and redistribute it as you walk, especially in areas like the heel and ball of the foot that take a beating when you are on your feet. Additionally, it offers dynamic arch support that adapts to your foot shape. Together, these work to cradle your foot for a unique fit for any work boot. These insoles are rather thick and heavy compared to some other models, so they may not be a good choice for people who do not have extra room in their work boots. There is also a slight break-in period where you may not get complete arch support until the insole conforms to the shape of your foot. They are also unavailable in wide or narrow widths and they have a shorter life span. This insole is a good choice for men who want to increase the comfort and arch support in their shoes, but don’t want to spend a lot. The insole helps align your spine by positioning your feet properly. This is customized because of the adaptive arch that will provide just the right amount of support. 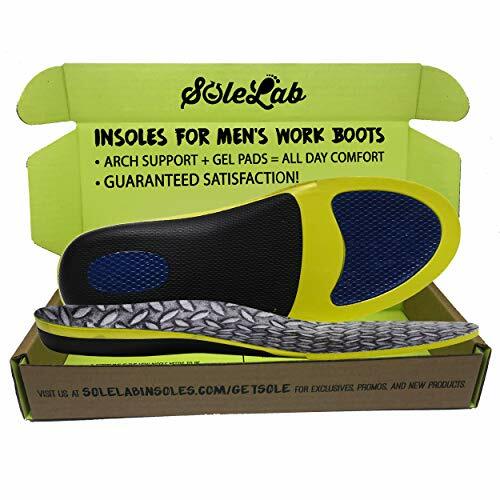 The Sole Lab Insoles for Men’s Work Boots Full-Length Comfort Orthotic has gel that helps rebound shock that you feel in your joints when standing or moving around in work boots. The rebound also helps give you a boost and return energy into your step, which reduces foot fatigue. In addition to arch support, this shoe supports the heel area really well. This is a great choice for people who tend to distribute their weight toward the back of their feet. As an added benefit, Sole Labs offers a 30-day guarantee. It is always nice when a company is willing to stand behind their product. While you can typically expect insoles to break down with time, these break down a little faster than some other choices. However, the price may be low enough that you may not mind replacing them every 1-3 months. There is also not as much support toward the ball of the foot as there is toward the heel. This insole is designed especially for big and tall men who are 200+ pounds. When you are on the heavier size, your joints and back take a beating after a long day of work. These budget-friendly insoles for work boots are designed to prevent leg fatigue and relieve back pain. The Dr. Scholl’s Pain Relief Orthotics for Heavy Duty Support for Men is designed to maintain a steady arch and provide support. It also has gel and foam materials in the heel and ball of your foot, which give you the rebound you need to cushion your joints when moving and walking in your work boots. This is especially beneficial on concrete surfaces, as it redistributes your weight so no single area of your body absorbs pressure. A deep heel cup helps cradle your foot and hold it into place, creating better motion control with your movements. Additionally, Dr. Scholl’s uses Arch Guard Technology that stops your foot from rolling inward when you walk. The money back guarantee is another plus. The arch support is not as customizable as it is in some other shoes, however, this makes the insole last longer because of the rigidity. The amount of cushioning in the heel is also not sufficient for some people, but the overall feel is very firm. These may make a squeaking noise during walking. The upper of this insole has an EVA forefoot pad increases the energy return as you go through the day, which supports your movements. On the bottom of this insole for work boots, a forefoot crash pad and heel pad reduce pressure in the areas that feel pain most when you are working all day. The Spenco Polysorb Heavy Duty Maximum All Day Comfort and Support also has lightweight Polysorb foam, which is made of a polyurethane material that gives heel and arch support. There is also a Spencore layer that absorbs shock, which adds comfort under your foot. On the outside of the insole, there is a 4-way stretch fabric. It is antimicrobial and prevents odor, while the soft outer prevents blisters and rubbing that can happen when wearing other insoles. These features all pair together to help your feet feel less fatigued at the end of the work day. While this insole does offer some arch support, it is minor. It might not support high arches. 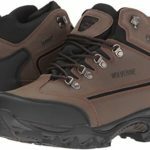 They also offer incredible cushioning, but this comes at the risk of a thick insole that may not fit into all work boots. Superfeet insoles have different colors to denote their specific purposes. The black insoles are for low to medium arches, and the green insoles are for high arches (both are reviewed below). 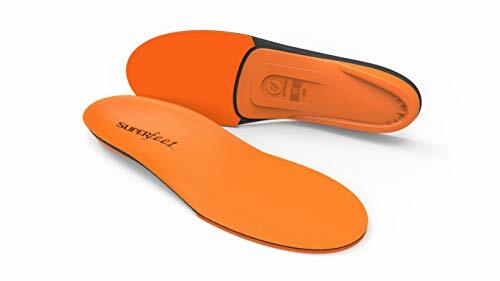 The orange insoles are also for high arches, but they have more protection in the forefoot. The benefits of this insole come from AeroSpring Dual Comfort foam, which absorbs the impact when you are walking in your work boots and disperses it through your foot. This cushions the forefoot during push off, making them an excellent insole for walking and standing for long hours. It also accommodates high arches, which is nice in an insole that also works for mid-level arches. It also has added cushioning under the ball of the foot, which is ideal for people who distribute their weight toward the front of their feet. Another feature of the Superfeet Orange Premium Insole is its composition, which is free of latex and meets vegan standards. It also has an all-natural NXT anti-bacterial coating, which helps prevent odors. The heel cup cradles your foot, which holds it in place and gives you maximum control over walking. Additionally, the cushioning is sufficient to help people who suffer from plantar fasciitis, generalized foot pain, heel pain, and arch pain. This insole is 2” high, which may be too large to be in some work boots without removable insoles. It is also narrow in the heel area, which can be a problem for some people, especially those who have a wider heel of the foot. These are only available in men’s sizes and they don’t stick to the shoe very well. The orange inserts aren’t the only great product from Superfeet. Their products relieve foot and leg fatigue while extending the life of your boot. The Superfeet Black Premium Insoles are a stability insole for low to medium arches that are available for youth, men, and women’s boots. This latex-free, vegan product treats ball of foot pain and heel pain caused by plantar fasciitis. 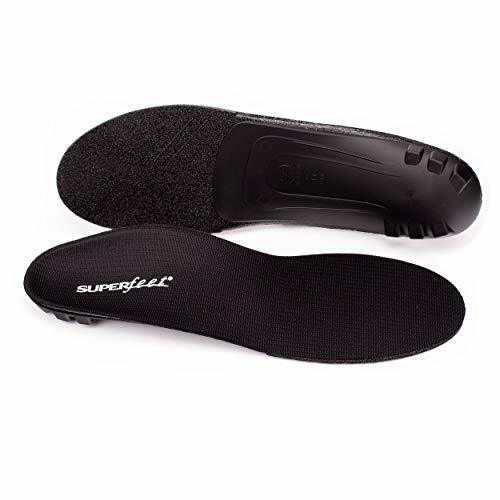 With a rearfoot stabilizer cap under the heel cup, the Superfeet Black insoles center the placement of your foot. This corrects overpronation and reduces the stress on your joints. A layer of high-density foam covers the whole length of the insole for long days on your feet, relieving pressure off of high-impact areas like the ball of the foot and the heel. With an antibacterial coating to prevent odors, the Superfeet Black Premium Insoles are a favored insert by men and women who work hard on their feet. If you have flat feet, these aren’t the best option since they don’t have enough condition to properly aid flat feet. These insoles are on the expensive side of the spectrum. You will experience a mild break-in period with these insoles, so don’t be alarmed if they feel strange for a few days. The Superfeet Green Full-Length Insoles are a firm replacement insole designed only for high arches. Measuring 2” high and 4” wide, these stability soles fit into youth, men’s and women’s boots. They easily slide into the bottom of the boot and remain in place during wear. The Superfeet Green insoles treat pain in the ball of the foot and the heel caused by inflamed connective tissue from the condition plantar fasciitis. To relieve your pain, a deep heel cup diffuses impact away from your foot at the beginning of your stride. The rearfoot stabilizer cap under the cup keeps your foot straight for better support to promote your healing. With an antibacterial coating to prevent odors, the Superfeet Green Full-Length Insole is best for men and women (and teens!) who have high arches. Like the other Superfeet products, this insole also has a mild adjustment or break-in period. These expensive insoles will likely hold up for less than a year with everyday use, which can become quite pricey in the long run. Finally, some users have noted a slight squeaking sound when walking. If you need balance and support from an insole inside a work boot, this is a great choice. It can even benefit people with foot conditions like plantar fasciitis because of the way it cradles and supports the heel. The deep heel cup also improves the fit of the insole, helps maintain stability of your foot, and aligns your body when you walk. The topmost fabric of the Jobsite Power Tuff Anti-Fatigue Support Work Orthotic Insoles helps increase breathability in any work boot. It is also anti-microbial and anti-bacterial. Heavy nylon absorbs shock in the heel area and adds support. All the features come together to reduce fatigue in your foot while walking, adding energy to your step. The shape of the insole is what helps relieve foot pain, since it prevents your foot from lying flat. Additionally, there is additional support on the topmost layer of the arch. This provides lateral support that is perfect for people who overpronate. The insole is also durable, which will withstand the abuse insoles can go through in the workplace. 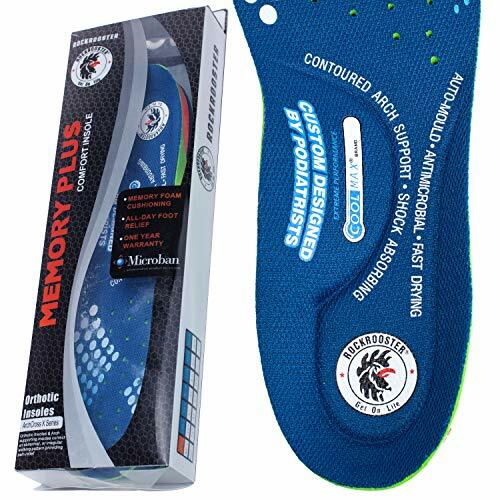 There is a break-in period for this insole, especially because the outside of the heel cup is made of a harder material. The boot insole also runs a little large. Though you can trim it to fit, there is a risk of trimming too much and then the insole may slide around under your foot. This insole offers contoured arch support for a customized fit. There are three levels in the heel area, which has three layers. The insole also has Poron performance cushioning, which adds softness and comfort. It also increases energy return, which helps prevent foot fatigue. Another great feature of the RockRooster Insoles for Work Boots and Arch Support is the CoolMax fiber technology. This outer layer helps regulate the temperature of your foot. It also provides antimicrobial protection to help with foot odors. The footbed is designed to provide anatomical support for your foot. It also provides lateral support to prevent pronation. However, this is done with a semi-rigid material that provides support without impacting flexibility. An Ortholite top layer completes the insole, providing lightweight support without making the insole too heavy. 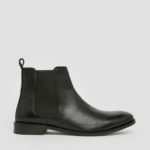 The heel area can be thick and heavy, which can make it hard to fit into some work boots unless you can remove the previous insole. There is also a break-in period, since it will conform to your foot, but it will be well worth it. Dr. Scholls is a trusted name in footwear, and many men and women have used their insoles as replacements in shoes and boots. Dr. Scholl’s Comfort and Energy Work Insoles are a budget-friendly insole that is ideal for those who work on concrete. The Massaging Gel technology helps with foot and leg fatigue, providing shock absorption where you need it. The gel insoles direct impact away from your joints, relieving the pain you feel from your feet up to your back at the end of every workday. With an adhesive that keeps the insole at the bottom of your boot, Dr. Scholl’s Comfort and Energy Work Insoles stay in place when you take your boots off. Available in men’s and women’s options, this product fits shoe sizes 8-14. A helpful guide at the toe line allows you to trim down the insole to fit your boots. The thickness of these insoles might make your work boots or work shoes feel small. That does make them ideal for boots that are a little too big. The insoles are thicker at the heel than the forefront, which isn’t the best concentration area of padding for all users. Finally, these insoles offer little arch support. If you love the EVA memory foam that comes with the insoles of your favorite athletic shoes, then the NAZAROO Orthotic insoles for Flat Feet are your perfect affordable match. With soft EVA memory foam under the high-impact areas of the heel and the arch, the NAZAROO keep your feet comfortable with every step. This reduces pressure under high impact areas. A deep heel cradle holds your foot securely in place, correcting overpronation and common foot problems associated with flat feet, including ball of the foot pain and heel pain, plantar fasciitis, and ankle pain. Work boots tend to run hot, so NAZAROO insoles come with anti-microbial and moisture-wicking technology. This keeps odor-causing bacteria from growing inside of the insole when it pulls moisture away from your foot. They will feel so comfortable you will want a pair for all of your footwear. 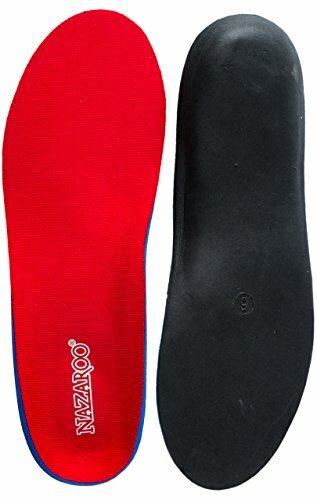 These insoles fit most shoes and boots. These insoles have a shorter life span and tend to wear down quickly. They offer lightweight protection only. If you have plantar fasciitis, you need a specific insole designed to treat your condition. The ViveSole Plantar Fasciitis Insoles were designed by podiatrists that treat men and women with plantar fasciitis every day. This condition, which is when the tissues that connect the bones in your toes to your heel become inflamed, is excruciating. With shock-absorbent pads under the heel and the forefoot, the budget-friendly ViveSole Plantar Fasciitis Insoles diffuse impact away from the joints in your feet. This relieves the pain associated with the condition. Crafted for men and women with flat feet by podiatrists, these insoles stabilize and center the foot to correct overpronation, which can aggravate your plantar fasciitis. 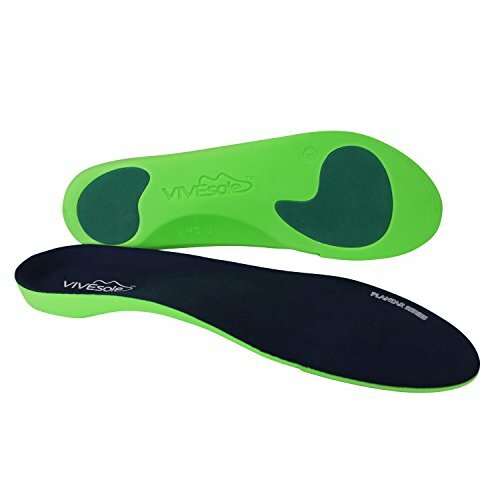 If you have been recently diagnosed with this condition, replacing your insoles with the ViveSoles may reduce the inflammation of the connective tissue in your feet. These insoles are not long-lasting. With daily, prolonged wear, they will break down quickly and need replacing after a few months. Some users find that these insoles are very firm, and yet they don’t offer that great of heel cushioning. Men and women with flat feet often find insoles uncomfortable. Most insoles have low to high arch support, which will cut into the bottom of flat feet – which is a lack of a defined arch. This will unnaturally position the foot, causing more pain instead of curing it. 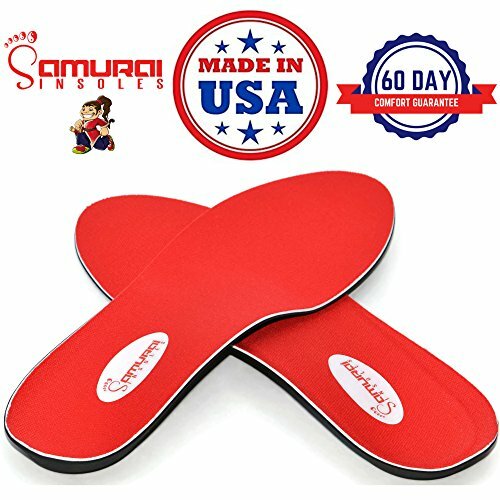 Designed by podiatrists, Samurai Insoles Instant-Relief Orthotics for Flat Feet are stability insoles that treat almost every foot pain condition. That includes heel pain associated with plantar fasciitis and problems from overpronation. One of the few insoles that are still manufactured in the USA, these insoles fit inside any work shoe or boot. They remain in place when you take your footwear off. Although they are not comfort insoles, the Samurai have shock-absorption features with bounceback and energy return. They relieve the pressure off of your feet with every step. 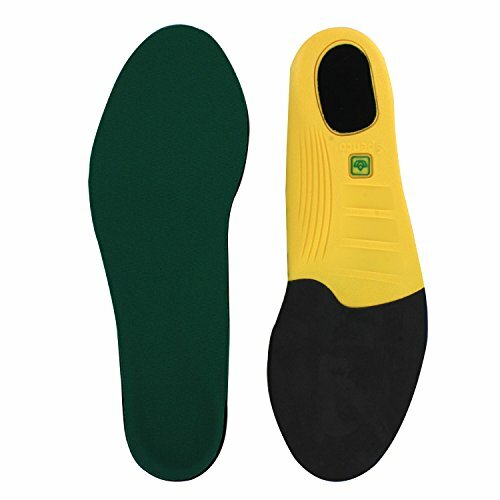 These insoles fit inside any work shoe or boot and remain inside when you take your footwear off. These insoles are not cheap- they are high quality and made here in the USA, and that naturally comes with a larger price tag. The coloring wears off and the design goes away after several weeks of wear. Some may find that the level of cushioning here is just not enough. What happens when you need an insole that fits in your work boots and your casual shoes? 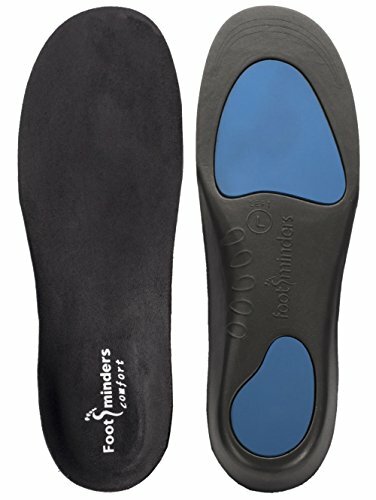 The Footminders COMFORT Orthotic Arch Support Insoles for Sport Shoes and Work Boots will suit both your work and play time. These moderately priced structural support insoles fir in work boots, casual shoes, and athletic shoes. For men and women who have plantar fasciitis, podiatrists recommend these insoles for flat feet or low/fallen arches. With deep heel cups for more stability and ankle support, the Footminders relieve foot pain and muscle fatigue. 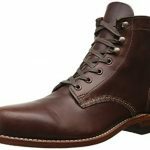 They easily slip in and out of your boots and shoes for replacement, meaning that you can have the same comfort on the job or a day out running errands. Why wouldn’t you want to be comfortable on your feet all the time? These insoles will wear down after just a few short months with everyday wear. They do run large, so measure your feet and your shoes well before ordering. As far as arch support is concerned, some say these have too much, while others complain of not enough. Many people think that insoles are the squishy gel inserts that you get from the drug store, but that isn’t true. There are two basic types of insoles: those made for comfort and those made for structural support. Comfort insoles will have softer materials, such as gel or memory foam. They will feel much softer underfoot, which will relieve conditions related to heel pain and ball of foot pain. While these materials feel comfortable to us, they are shock-absorbent. This means that they diffuse impact away from your joints every time your foot hits the ground. It makes walking on harder surfaces, such as concrete and gravel, much more comfortable on our feet and joints. Other insoles will feel firmer because they are made of harder materials. This is because they provide structural support to the feet. These orthotic insoles correct foot misalignment, such as pronation issues that you will feel as joint and back pain. This misalignment can also manifest as foot disorders, such as plantar fasciitis and metatarsalgia. Structural insoles are also designated by arch type – from flat feet to high arches. If you feel pain in the ball of your foot after long days on your feet, you probably need more arch support. Why Do I Need an Insole? While factory insoles in work boots are the best fit for that particular type of boot, that doesn’t mean it’s the best match for your feet. Many workers will pull out their factory insoles and replace them with comfort or work insoles because they cater to their foot needs. Especially if you have problem feet, such as flat feet, plantar fasciitis, heel pain, etc., you should always have a quality pair of insoles to keep your feet ache-free for long days at work. Wearing insoles suited for your feet can prevent later foot disorders which might require surgery, and they even extend the life of your boots. Of all of the features of great work boots, the insole is unfairly ignored. This part of your foot delivers comfort and support to your foot as your walk and stand throughout the day, so it should be one of the most important features to consider when purchasing a work boot. Unfortunately, they are the first parts of your footwear to break down, so they are the quickly replaced. The best advice for choosing the best insoles for work boots is to know your own feet! One of the greatest mistakes that people make is assuming that their feet should hurt after a long day of work. With the right insole, you can find something to conform to your foot and offer the perfect support where you need it most. Whether you stand on concrete all day, climb ladders, kick around some dirt, or do other work, one of the insoles on this list will improve how your feet feel.